The philosophy underpinning this progress has been that of continual improvement. This has been aided by being able to work closely with major racing, rally teams, competition engine companies and automobile manufacturers. The desire of these organisations to achieve optimum performance in their area of expertise has given MoTeC the impetus to continually improve. 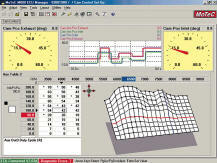 Examples of this include Data Acquisition, Overrun Boost Enhancement and Boost Control on rally cars, Traction Control, Full Throttle Upshifts and Gear Dependant Shift Lights on race cars, Close Loop Lambda Control (Narrow Band & Wide Band), Idle Speed Control and Sophisticated Acceleration / Deceleration Enrichment / Enleanment on road cars. 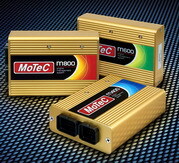 MoTeC Engine Management Systems are used worldwide at the highest levels of motorsport and are subject to continual improvement. Furthermore, MoTeC offers a 2 year warranty against defects however this is subject to the product being installed by an approved MoTeC installer. Send mail to webmaster@hiperracing.com with questions or comments about this web site.